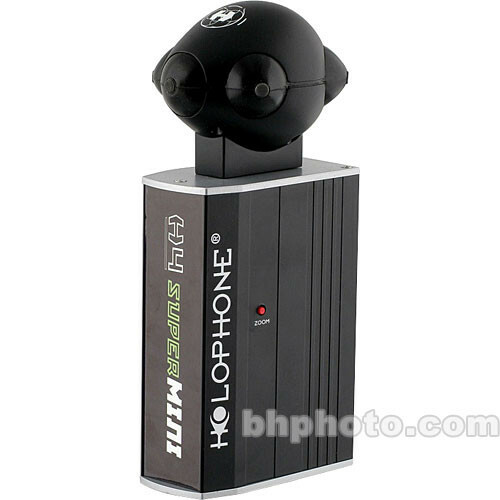 The H4 SuperMINI 5.1 Surround Sound Microphone from Holophone is a camera-mountable microphone designed to achieve professional 5.1 surround audio capturing and monitoring. It offers an integrated multichannel preamplifier, virtual surround headphone monitor and matrix surround encoder in a compact package; mountable on any professional-quality video camera. The microphone capsule features six elements that are can send signal to a matrix encoded, stereo analog output. Six line-level outputs (L, R, C, LFE, LS, RS) provide a pre-encoded alternative for isolating surround signal to discrete tracks on multitrack recorders, external surround processors, mixers, etc. Virtual Surround Monitoring provides a virtual 3-D representation of surround encoded audio signal on standard stereo headphones. A center-channel input connection may be used for connecting a mono microphone, such as a shotgun or lavalier microphone, to enhance sonic opportunity options. The Holophone H4 SuperMINI is a powerful tool that brings surround sound recording, encoding, and monitoring capabilities into the hands of video camera operators. The H4 SuperMINI features six capsules that send audio signal to a surround matrix encoded, stereo analog output. Six line-level outputs (L, R, C, LFE, LS, RS) are provided for isolating surround signal to discrete tracks on multitrack recorders, external surround processors, mixers, etc. Virtual Surround Monitoring provides a virtual 3-D representation of surround-encoded audio signal on standard stereo headphones. Encoded LT/RT matrix output is compatible with Dolby Pro-Logic II and all similar 5.1 channel stereo matrix decoding schemes. A center-channel input connection may be used for connecting a mono microphone, such as a shotgun or lavalier microphone, to enhance sonic opportunity options. A zoom button increases the forward bias of the pick-up pattern. This powerful microphone system is completely portable and operates on only four AA batteries for up to five hours. Box Dimensions (LxWxH) 13.1 x 11.6 x 7.7"